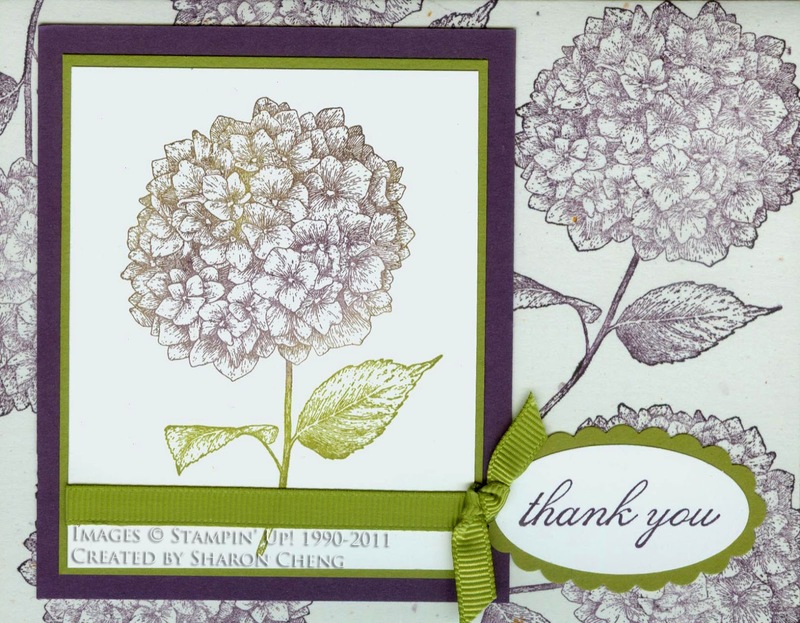 You will be surprised at how quickly you can color the hydrangea flower from Stampin' Up! 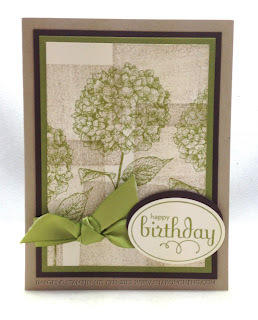 's Best of Flower stamp set using sponge daubers and blender pens with this tutorial. The key to success is to use a light touch and to remember that you can always go darker, but you can't go lighter. Don't try to get all of the dark areas filled in at the beginning. You can always go back and add more color. Note: This hydrangea is from the retired Stampin' Up! hostess stamp set, Just Because. 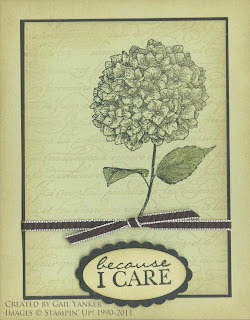 Find out more about how I got my images mixed up and see the REAL Best of Flowers Hydrangea card. The good good news is the the tutorial works for both cards. Here are the sizes for the card stock. Early Espresso: 2 3/4" by 4"
Perfect Plum: 8 1/2" x 5 1/2"
Stamp the flower on the Very Vanilla card stock with Early Espresso and set it aside to dry for at least 20 minutes. 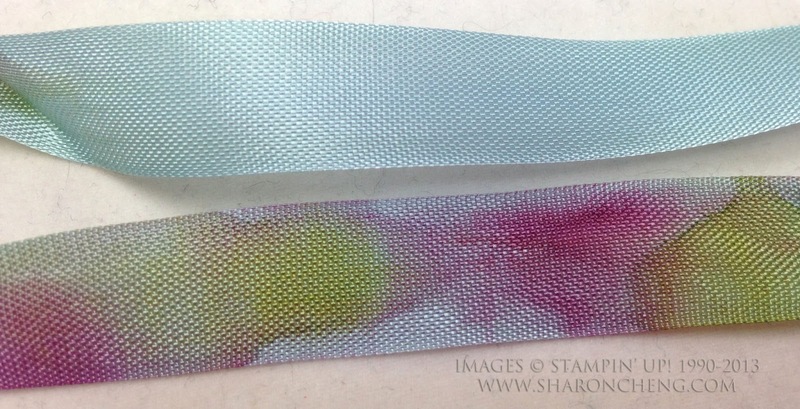 You want the ink to be completely dry before you start adding other colors with the sponge daubers and blender pens. Remember to use a light hand. You aren't trying to "scrub in" the colors on the paper. You're putting them on lightly like you would put make up on your face. If you have a heavy hand, try embossing the flower with Early Espresso embossing powder on watercolor paper. That will make it easier to blend Baja Breeze, Rich Razzleberry, Old Olive and Perfect Plum while leaving all of the details of the flower in Early Espresso. This picture shows the four steps to color in the hydrangea. Click on the picture for a close up view. 1. Use a sponge dauber to add Baja Breeze. Notice that I didn't color in anything solidly. You want the colors to blend just like they do in a real hydrangea. 2. Use a sponge dauber to add Rich Razzleberry. Use a light hand! 3. Use a blender pen to add Old Olive to the leaves and small areas of the flower. 4. Use a blender pen to add Rich Razzleberry and Perfect Plum to the outer edges of the flower. To color the ribbon, dampen the Baja Breeze Seam Binding ribbon with water. Use the sponge dauber to brush on Old Olive and Rich Razzleberry in different places on the ribbon. Be sure to allow some of the Baja Breeze to show. To attach the ribbon, I put a strip of snail directly on the Very Vanilla card stock and scrunch the ribbon as I stick it to the card stock. 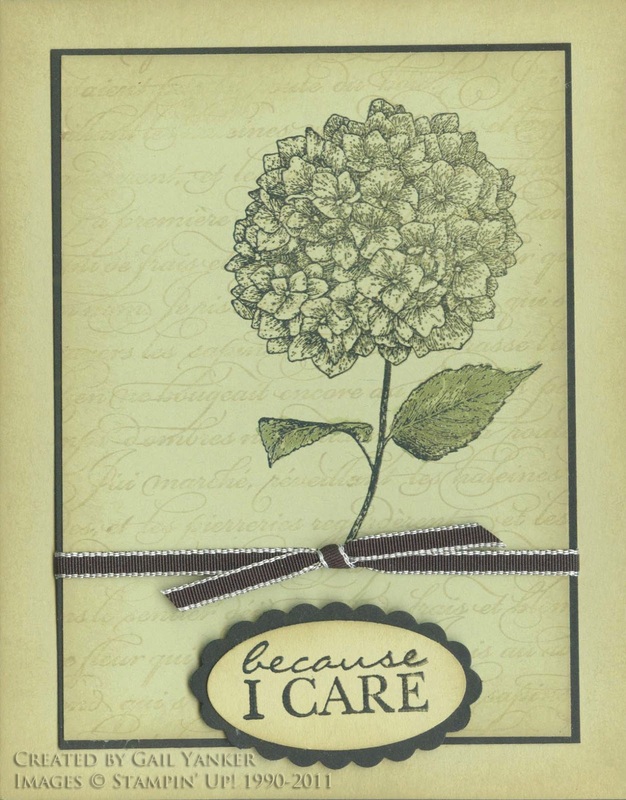 While you can use any sentiment, I used "Just for You" from the Pop-Up Posies Designer Kit. I also cut one of our paper doilies into 4 pieces and used two of them for this card. I really liked this image the first time when it was in the hostess set, Just Because. Here are some of the cards I made or received in swaps back in 2010 and 2011. While some of the elements are retired, you can see how versatile this hydrangea can be. For this first card, I used pastel chalks to get the soft colors. 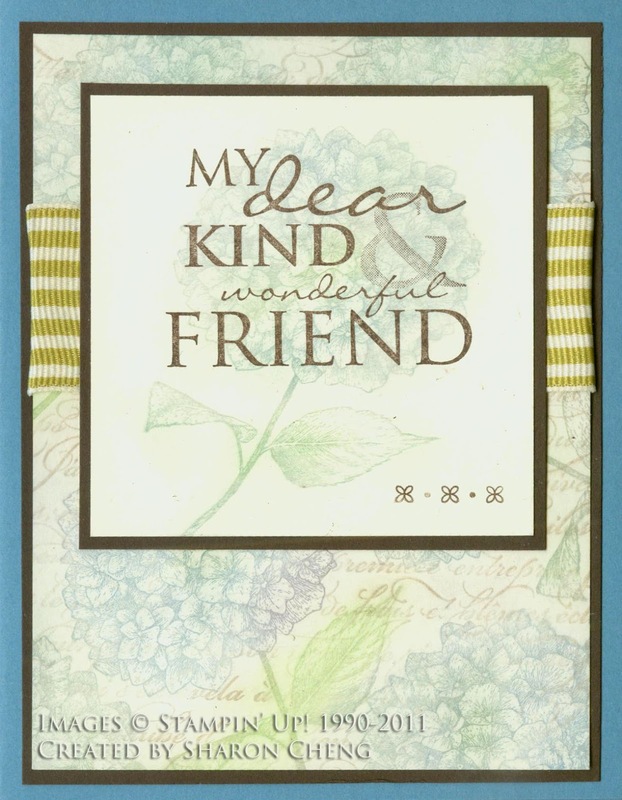 You could get a similar effect by coloring directly on the stamp with Stampin' Up! 's Watercolor Wonder Crayons, spritzing it with water and then stamping on card stock. 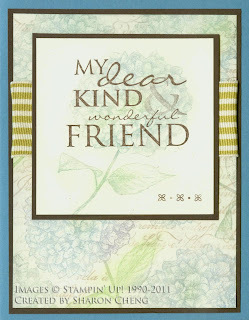 I loved this card that I received in a swap from Gail Yanker and CASEd it for a class. River Rock and Basic Black make a stunning color combination. Here's another card I made where I used the hydrangea for the focal point and the background. I CASEd this card made by Marilyn Young. She made the background by using a clear acrylic mount. She stamped the block on the ink pad and then on the card stock. With our new firm foam ink pads, you may have to stamp off once on a scrap piece of paper before stamping on the card stock. 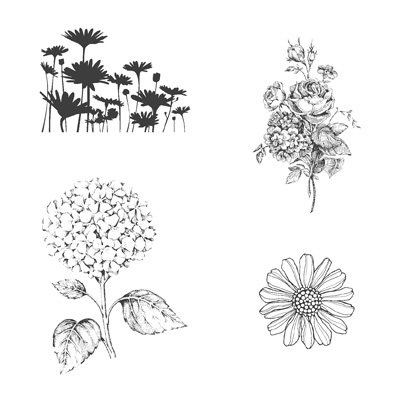 Here are all of the images in the Best of Flowers stamp set. 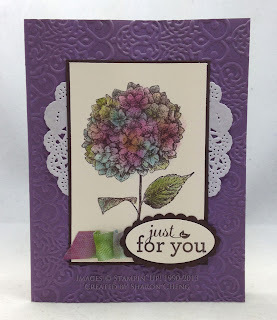 I'm glad that Stampin' Up! is celebrating its 25th Anniversary in such a fun way by bringing back some great images along with new ones. The flower on the lower right can be punched out with our 1 1/4" Scallop Circle Punch. I hope you've enjoyed this trip down memory lane along with the tutorial for my new card.